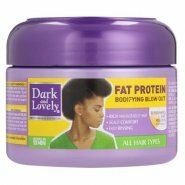 The Dark And Lovely Fat Protein Bodifying Blow Out is a ready-to-use blow out treatment that gets to work in just 10 minutes to texturise and soften hair. The secret lies in its rich, replenishing fat protein formulation that leaves hair more manageable, stronger and more resilient. When I have short hair I opt for curl-ironing styling my hair. I have very coarse hair and this is one of the few blow-out/relaxers that straighten my hair without a burning/ tingling sensation on my sensitive scalp.